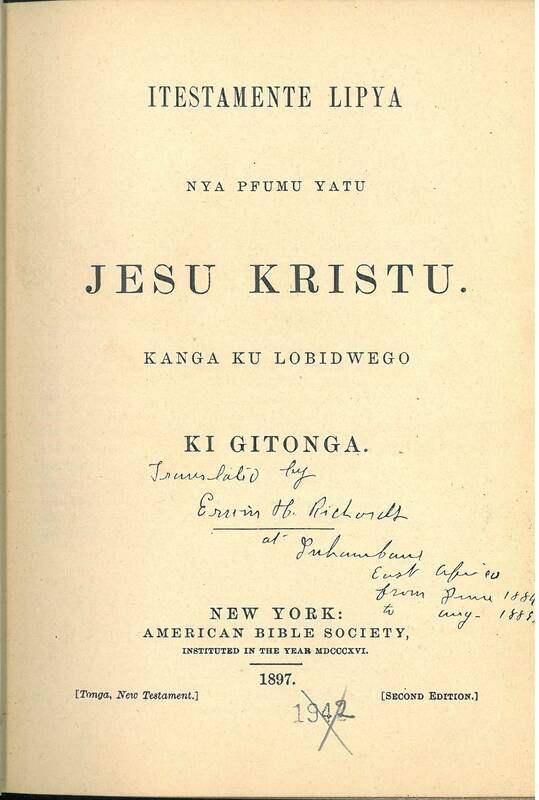 This translation was produced by Erwin H. Richards in East Africa from June of 1884 to August of 1889. In 1897 Bishop Hartzell of the Methodist Episcopal Church requested the American Bible Society to publish a corrected reprint of the New Testament. This edition of 500 copies was issued with the cost being defrayed by the Pennsylvania Bible Society. The New Testament was published in parts at a mission press in Inhambane. Matthew and Mark were published in 1888 and Luke to Jude were published in 1889. Revelation was published by the ABS in 1890 in New York. This edition is a revision of that earlier work so it is called the “Second Edition” on the title page. However, it was the first edition of a one volume New Testament published by the ABS. Title: Itestamente Lipya nya pfumu yatu Jesu Kristu. 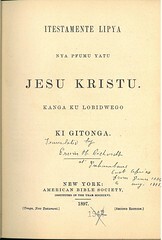 Kanga Ku Lobidwego Ki Gitonga. Publisher: New York: American Bible Society. References: Darlow & Moule: 9326, The Book of a Thousand Tongues (1972) entry 1280. Facsimile: A pdf facsimile of the 1905 edition is available at books.google.com. According to the Darlow & Moule entry, an edition of 500 copies was issued in 1897 with funds provided by the Pennsylvania Bible Society. Translated by E.H. Richards, American Board of Commissioners for Foreign Missions. Translated by W.E. Smyth, Society for the Propagation of the Gospel. — From The Book of a Thousand Tongues entry 1280.